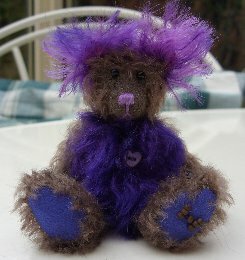 We are delighted to introduce you to Oaken Pin, one of the first bears of 2013. He is 3 1/2" tall and is made of dark mushroom brown South African mohair, quite sparse and tufted and for contrast his tummy and ears are made of much longer deep purple German mohair. This fur has swirls of paler purple through it, his pads and paws are deep purple ultrasuede and we have given him a pale purple stitched nose. Oaken Pin is one of our Apple varieties collection, he is a very sweet little bear with a heart shaped lilac belly button. His eyes are shiny black English glass and he is steel shot filled for weight. As you can see, he is adorable and I do hope that you like him, our first offering of the New Year. Oaken Pin costs £35 plus postage. Please note that as with all our bears, Oaken Pin is not a toy and is not suitable for children. Sorry - Oaken Pin has been adopted.